“Stay flexible, stay humble, and keep learning.” This was Jacqueline Chua’s advice to students in her opening keynote address for the Women in Finance Conference on Sept. 19, 2017. As the Vice-President of the Financial Women’s Association of Singapore, she shared about how she entered the finance industry and the blurring of lines between genders in the workplace. The keynote speech was followed by a moderated panel discussion, with female panelists from Bloomberg, J.P. Morgan (Cybersecurity), and Goldman Sachs. The discussion revolved around insights on current projects and on working in their respective fields. “The speakers emphasized that self-advocacy is crucial but that it’s not necessary for women to view themselves as any different from men in the industry,” Anmei Zeng ’21 said. This was followed up with breakout sessions on finance internships and the basics of investing. Lloyd Koh ’21 said that attending the conference gave him a better understanding of the world of finance and the involvement of women in it. The Women in Finance Conference is one of the many initiatives led by Women in Finance, one of the three specialized sub-committees of Women in Business. The other two committees are Women in Tech. and Women in Entrepreneurship. Chandler Beyer ’20 and Betty Pu ’20 were inspired to found Women in Business after attending the Intercollegiate Business Convention (IBC) organized by the Harvard Undergraduate Women in Business. Beyer said that since she and Pu did not see any organizations on campus dedicated solely to empowering women and creating networks for women, they wanted to create a platform where women can develop themselves professionally and personally to be future business leaders of the world. “I want Women in Business to teach other young women how to play their cards right. The men know how to do it – they exchange notes and tips all the time within their social circles. It’s time for women to have a support network of their own that’s dedicated towards mentorship and empowerment.” Pu said. Both said that the drive to create a supportive space for women went much further back. Pu talked about how, unlike her brother, she was always reminded of her gender while growing up. For Beyer, it was a compilation of many instances. Like most women in the science, technology, engineering and mathematics (STEM) fields, Beyer shared that it is normal for her to be one of the only females in a room of programmers. “You know something is not right when such instances have become a norm. We have to do something about it.” Beyer said. The name of the organization, Women in Business, also serves to support the notion that women can still be proud to be women when going into female-underrepresented industries. Even so, men are welcome to be members of Women in Business and its sub-committees, to promote inclusivity instead of exclusion. “We would be shooting ourselves in the foot if we only make it open for women, instead of all genders and representations. Everyone deserves to talk about [the involvement of women in business and finance],” Pu said. Still, starting this organization did not come without its challenges. Pu has been confronted with many questions, the key one being — what is she is fighting against with the founding of this organization? Today, there are more laws against discrimination and women have more equal rights, but it seems the biggest battle is internal. 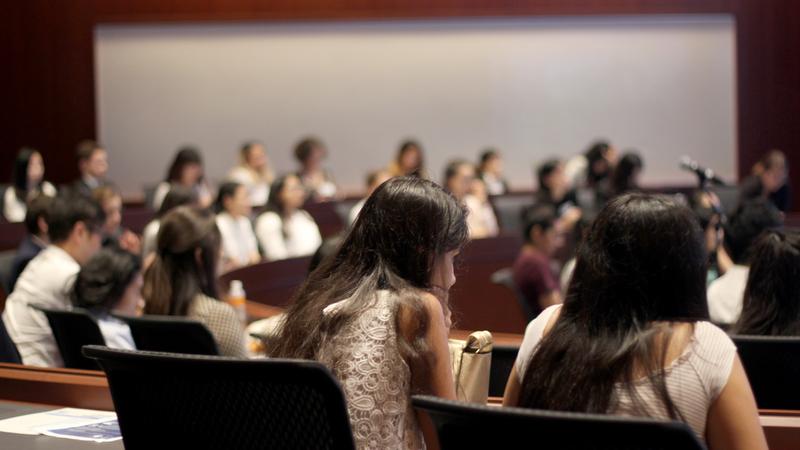 Participants listening attentively during the conference, held at Yale-NUS College. Having worked with Girls Who Code, a national non-profit in the United States working to close the gender gap in the STEM fields, Beyer realized that one of the biggest factors in deterring women from entering these fields was the misconception that they would not perform well compared to their male counterparts. “Women tend to be more critical of themselves compared to men and that is exactly what Women in Business is trying to address. Betty and I are hopeful that the initiatives our members are leading is a step in the right direction for dissolving this misconception,” Beyer said. Previous initiatives of the sub-committees include Python workshops, Google and Bloomberg office tours, weekly brunches, and networking sessions in partnership with Centre for International and Professional Experience. Future programs include talks with representatives from VISA and Carousell, a Java workshop, and conferences. Beyer said that she was heartened to see the positive changes in the members, including their increased self-confidence. “We started an organization that got people talking; about women in business, about diversity,” Pu said. As a woman, it was difficult to leave the conference without feeling inspired; being made more aware of the greater role women can play in business and finance. That, perhaps, was what Pu was talking about; that larger change starts from inspiration within.